The road starts at Sitapaila, in western part of the ring road within the Kathmandu valley and links it to Dharkei, a small settlement at 3-6 km on the Prithipi Highway. This road is an alternative route to enter to the Kathmandu valley. 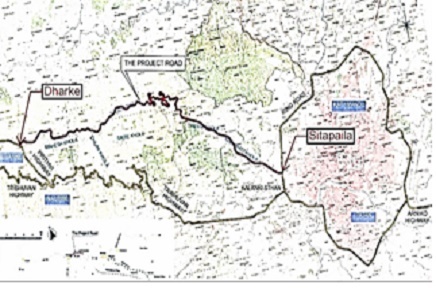 At present, the existing road is fair weather with a total length of 23 km but proposed road length is about 35km. it will serve as an alternative route for the existing Thankot–Naubise–Dharke road which is the part of the Private highway. The alignment passes through unstable slopes at different places. The alignment requires considerable improvement in road geometry, slope stabilization, retaining structures and drainages, major bridge and possible tunnel. The Department of Roads intends to identify the appropriate route with require parameters and standards. Construction of this road will give relief to residences in of the Kathmandu valley and as Kathmandu is the capital of the country whole population of Nepal will be benefited from this road. Now due to the inadequacy of the capacity of the existing route to serve the existing traffic the proposed road provide service to the traffic at the same time provide an alternative route to inter the Kathmandu Valley. Feasibility Studies and Detailed Engineering Design and Tender Documents. 1. Feasibility Study of the stretch of road (35.00km) and 8 Bridges. 2. Detailed Engineering Design of (35.00km) road and 8 Bridges.